Sebastian Vettel says his hopes of securing pole position at the Abu Dhabi Grand Prix had begun to fade as early as Q2 at the Yas Marina Circuit. 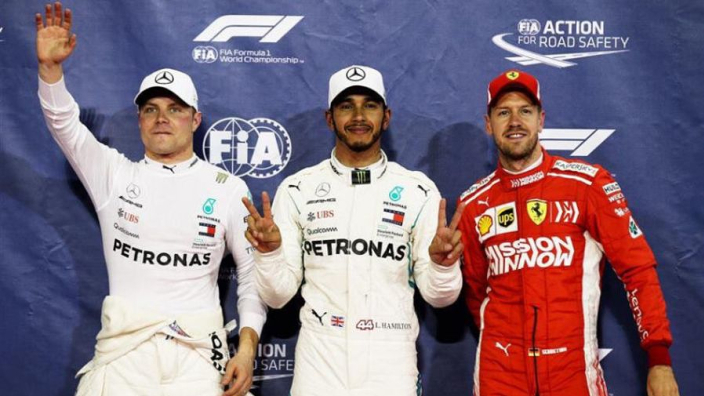 Pole-sitter Lewis Hamilton signalled his intent with a lap record time set on the medium compound of the weekend – a lap that sowed the seeds of doubt in Vettel's mind. With ultrasoft tyres on, Hamilton clocked 1:35.693 – almost seven tenths clear of the sister Mercedes of Valtteri Bottas and more than a second quicker than Vettel and Kimi Raikkonen could manage in the Ferraris. Even with hypersoft tyres on, Max Verstappen could only close to within four tenths and Hamilton went on to lower the record to 1:34.794 to take pole, with Vettel back in third, three tenths off. "In Q1 it was really tight so I thought we would have more of a say but in Q2 I think Lewis put a really strong lap in on the harder tyres," Vettel said. "I thought 'ah, it's going to be difficult'. "Then the first run in Q3 I had a really good lap which was very close again but they must have still had some cushion for the last lap. I did improve and I think the track ramped up but not enough to be a threat." Vettel and Ferrari have lost out in both championships to Hamilton and Mercedes this year, something that the German hopes to use as a motivational force. "If we do our job really, really well and we work together then we have a chance of finishing higher up," Vettel said. "It is needless to say that Lewis is on an incredible run over the past five years and since the day he joined Formula 1 until now to be honest. "I think it is the fifth consecutive pole and front row lockout for Mercedes so it also proves they are doing a really, really good job as a team. It is something for us, and it is not that easy, but it is a challenge to beat such a strong team but that is our target."